I become a big coffee drinker when the weather cools off. 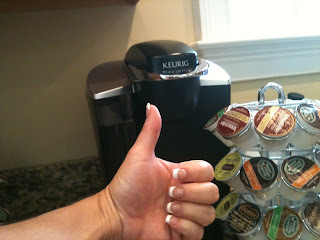 During our SC summers though, the mere thought of coffee makes me queasy, literally. And, the diehards who drink it throughout the day; how do they do that? Or the Marlboro Coffee Man/Woman who drinks a steamy cup with a cigarette dangling out of their mouth. And, I have never understood how some people can order a sandwich and a cup of coffee. I mean, coffee just isn't a "with a meal" kind of drink. I guess maybe if you're a Mount Pilot girl perhaps (Hi, Doll). It Ain't Pretty, but it's Homemade! GROUPON has finally come to town! 90% off at Restaurant.com: Insane!